As Ivan wrote in: “Good advice on your 30th birthday”. Although I have to wonder if maybe he should have gotten it in reverse so he could read it in the mirror. Or maybe his motivation was to reassure everyone that he wasn’t as complicated as he seems if they were to meet him without a shirt on. Either way, this tattoo was done by Kelly Smith at Body Graphics in Philadelphia. Those of you missing the reference, please turn in your geek card. If you want to earn it back, you’ll have to go read the The Hitchhiker’s Guide to the Galaxy. Come on, isn’t that required reading? 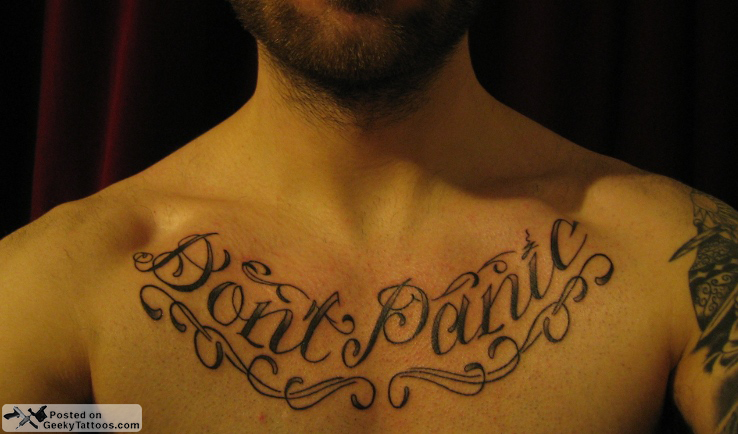 Tagged with Body Graphics, chest, Don't Panic, Hitchhiker's Guide to the Galaxy, Kelly Smith.